In this video tutorial you will learn how to make the crocheted zig-zag puff stitch. Candy from Meladora’s Creations has made 2 great video tutorials, one version for right-handed hookers and one for left-handed crocheters. In the video, she clearly demonstrates how to crochet this great puff stitch looking like a zig-zag pattern. 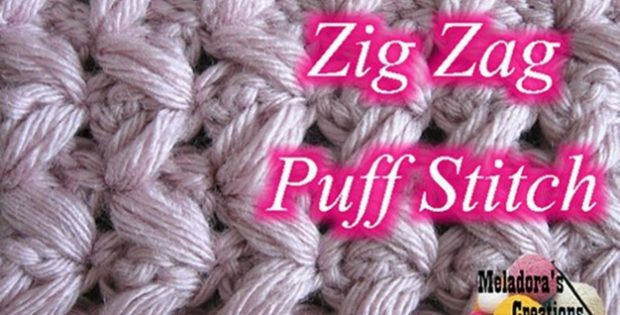 Candy has also made written instructions for how to make this zig-zag puff stitch. She has accompanied her instructions with a great photo tutorial. You can access the written instructions and photo tutorial here: Zig-Zag Puff Stitch Written Tutorial. Click the NEXT button below to watch the LEFT-HANDED version of this video tutorial! Watch this video tutorial and learn how to crochet the zig-zag puff stitch!